SANTA CRUZ ISLAND—Thirty-eight volunteers joined together onboard the Island Packers ferry Islander and headed offshore to the east end of Santa Cruz Island to remove trash from several beaches. “Most years we go to Chinese Harbor on the island’s north shore for this annual trash removal, but weather conditions weren’t favorable, so we headed south east to Yellow Banks,” said Alex Brodie, Island Packers fleet captain. 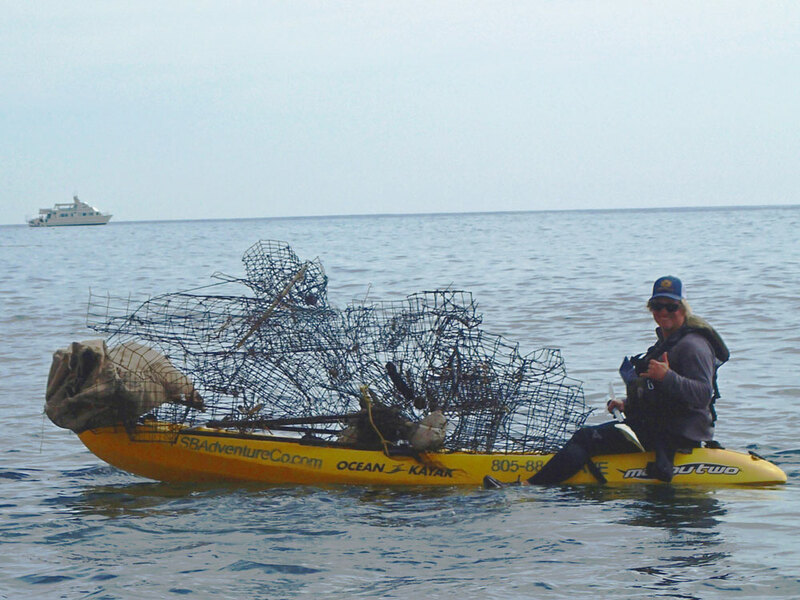 For the past decade teams of volunteers from diverse backgrounds have gathered together each year to remove trash build up from the Channel Islands National Park. This year, more volunteers than ever weret involved. “It was a great turnout and everyone was thrilled to be a part of this important project. We all depend on a clean environment and this is one way we can help the cause,” Brodie said. In addition to Cohen’s company, the coalition included Santa Barbara Channelkeeper, Environmental Defense Center, Channel Islands National Marine Sanctuary, Aquasports, Channel Islands Outfitters, Santa Barbara Zoo, Ty Warner Sea Center, California Condor Project and Four Seasons Hotel. Volunteers got in kayaks and went ashore. An inflatable skiff was also taken to land volunteers on the beaches and help with shuttling trash back to the boat. “We removed the Islander’s aft deck seats and covered it with tarps to convert it to a ‘garbage scow’. We removed 1,300 pounds of trash and had to leave about a ton more. We just ran out of room,” Brodie said. Trash consisted mostly of plastic, but some unusual items were picked up as well, like an actual message in a bottle. Back in Ventura Harbor, Islander docked at the National Park headquarters to unload all of the trash with the help of National Park crew. Most of the trash was recyclable. For more information, visit sbadventureco.com.